It doesn’t get much more Southern than a glass of iced tea. But what you might not realize is that the very glass of tea you love has its roots right here in the Charleston area – in the town of Summerville, to be precise. Now the town is celebrating its tea history with the Sweet Tea Trail. The tea plant (Camellia Sinensis) arrived in Summerville in the late 1700s imported by Andre Michaux, a French explorer and botanist. In 1888, Dr. Charles Shepard was the first to successfully propagate and produce tea for consumption when he acquired 600 acres in Summerville and established the Pinehurst Tea Plantation. Dr. Shepard produced award-winning teas until his death in 1915. His plantation was then closed until 1963 when Lipton paid to have the surviving tea plants at Pinehurst relocated to its experimental tea farm on Wadmalaw Island. That experimental tea farm – now owned by Bigelow and run by professional tea maker William Barclay Hall – is now the Charleston Tea Plantation. Every Camellia Sinensis plant growing at the Charleston Tea Plantation is a direct descendant of Shepard’s 1888 crop. Sweet Tea Trolley Tour: Visitors can board a trolley for a 90-minute guided tour through the back roads of Summerville to see historic homes and a glimpse of where tea first started. Guests also tour Historic Linwood Gardens, named one of the Top 10 Garden Inns in the world by BedandBreakfast.com. For tour times and tickets, visit lowcountryloop.com. 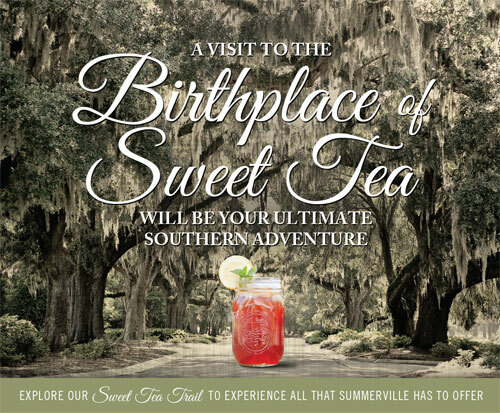 Good Eats on the Sweet Tea Trail: Summerville resident and nationally known storyteller Tim Lowry takes guests on an entertaining tour of Summerville with stops at restaurants and bakeries for such Southern delicacies sweet tea cupcakes and sweet tea pecan pie. For tour times and tickets, visit lowcountryloop.com. Tina Zimmerman, coordinator of tourism in Summerville, said she’s trying to give visitors a truly unique experience. She’s established a variety of tours and opportunities for visitors to explore Summerville’s historic and shopping districts as well as a garden district with a self-guided walking tour and a stop at Azalea Park with its original sculptures and early spring blooms. Visitors headed to Charleston can stop off in Summerville, spend the day exploring the quaint town square, dining in local restaurants and taking a tour of the town’s historic spots before heading down Highway 61 past the plantations and into Charleston.